On 21 April 2016, Britain celebrates the 90th birthday of HM The Queen - the country's longest-serving monarch. Classic FM takes a look back at her life in pictures. 1929 Princess Elizabeth in the park. 1936: Early life of princess Elizabeth - Princess Elizabeth takes her pet dog for a walk in Hyde Park, London, on Feb. 26. 1936. She was then nearly ten years old. Her father was still duke of York. Edward VIII was on the throne. 1952: The front page of the Sunday Graphic newspaper, after the death of King George VI, with a headline "The King the People loved, the Queen who is our Hope"
June 1953: Queen Elizabeth II and the Duke of Edinburgh at the Queen's Coronation. The ceremony took place at Westminster Abbey. 1960: Queen Elizabeth is holding Prince Andrew while the the Royal Family is on an outing in the grounds at Barmoral, Scotland. 1969: During the investiture ceremony at Caernarfon Castle, Queen Elizabeth II crowns her son, Prince Charles, as the Prince of Wales. 1972: Prince Charles, Prince Edward, Queen Elizabeth II, the Duke of Edinburgh, Prince Andrew, and Princess Anne poise for a picture at Buckingham Palace, London. 1972: The Queen and the Duke of Edinburgh celebrate their anniversary in the Belgian suite within Buckingham Palace. 1977: After the end of the procession, Earl Mountbatten of Burma, Queen Elizabeth II and the Duke of Edinburgh wave to the crowd from their Buckingham Palace balcony. 1979: The Queen Elizabeth dines with Sheik Isa bin Salman Al Khalifa of Bahrain. 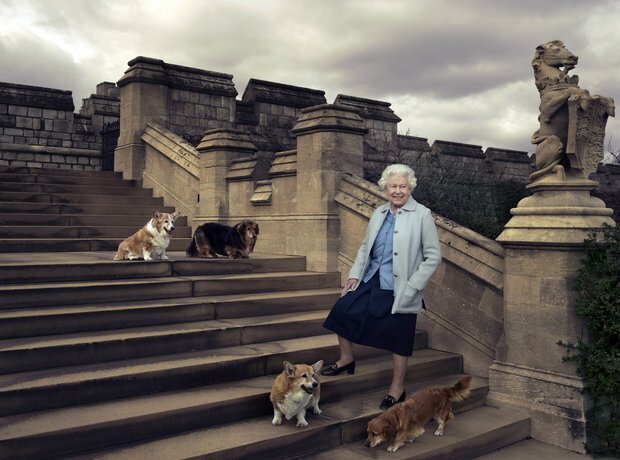 Spring 1980: During the Windsor Horse Trials, the Queen is spotted walking her corgis on the Cross Country Course. 1982: Queen Elizabeth II meets with Pope John Paul II at the Buckingham Palace, London. 1982: Queen Elizabeth II at a reception after opening Canberra's National Gallery during an Australian Tour. 1992: The queen arrives at spencer house to attend a dinner hosted by the present and former prime ministers to mark the 40th anniversary of her accession to the throne. September 1997: At Buckingham Palace, the Queen and the Duke of Edinburgh walk through the numerous floral tributes to Diana - the Princess of Wales. 2002: Queen Elizabeth II waves to the crowd as she rides, in the Gold State coach from Buckingham Palace to St Paul's Cathedral for a service of Thanksgiving to celebrate to her Golden Jubilee. The coach was built for King George III in 1762, and has only been used by the Queen twice before - for her Coronation, and her Silver Jubilee. Later, after lunch at Guildhall in the City of London, she will watch a parade and carnival along The Mall. Monday night saw more than one million people gather in central London to hear the Party in the Palace concert, and to watch a spectacular firework display. 2002: The Queen and the Duke Edinburgh watch fireworks explode over Buckingham Palace in celebration of her Golden Jubilee. 2003: Queen Elizabeth II and the Duke of Edinburgh, their oldest son, the Prince of Wales, and his oldest son, Prince William poise for a picture before dinner to mark the anniversary of her Coronation. 2003: The queen visits the West African country of Nigeria with the Royal Fathers at the British High Commission in the city of Abuja. 2010: The Queen and her husband visit the University of Sheffield Advanced Manufacturing Research centre. During the visit, the royal couple wore 3D glasses to watch a display and pilot a JCB digger. Queen Elizabeth II and The Duchess of Cambridge arrive at Kings Cross St Pancras Station, London, before boarding a train to visit the city of Leicester on the first date of her Diamond Jubilee tour of the UK.